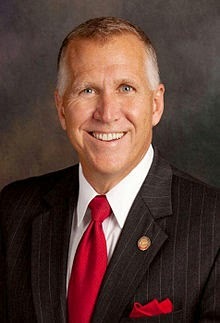 Did Thom Tillis major in public relations? Because he's damn good at image. Slick, but he also makes a solid presentation. He's well spoken and confident. Perhaps his greatest personal trait: He never lets you see him sweat. "Without prescription." That would be Thom Tillis sweating. Without prescription. Let's define that: "Without prescription" would have to mean "without the participation of a medical professional." Medical professionals have recently been mandated by The State to interfere with women's decisions to protect the Unborn. Tillis's statement is particularly noticeable, because last year he led the General Assembly to impose new ultra-sound imaging and stern moral lectures on any woman seeking an abortion in North Carolina ... legislation so extreme that a Federal judge has put a hold on a substantial portion of it. The judge seems to think that you can't make doctors say stuff -- freedom of speech -- about your pet hobby horse. Smart guys like Tillis read the polls. Women are pissed off. The Hobby Lobby decision was just another brick in a long wall that's been a-building for years. Add to that the very specific and cutting reasons that women already had to dislike the General Assembly: the destruction of the social contract to educate kids, take care of sick, minister to the poor, and keep poisons out of our water and our food. For a start. If Tillis majored in Public Relations in college, Tami Fitzgerald didn't major in logic. The man's selling you out, lady, to get votes. And he'll sell you out on gay marriage, given the chance. In your heart, you know I'm right. Conservatives like Tillis want OTC contraception because it removes it from the employer's realm. No more Hobby Lobby cases to mess up the messaging with the ladies. And passes the buck to the ladies to cover all of it. not be able to afford the pill. And of course with no funding for Planned Parenthood or other agencies helping these women, you can count on even further divisions between the rich and the poor--just what all GOPer policy promotes.